Magician shows empty paper box & place it on table. After magic pass produce 3 Vase with gorgeous bouquet one by one. 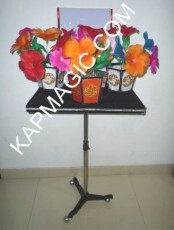 The item includes: Paper Box, 3 Bouquets, 3 Vase and a Table which can be separated to portable parts.